If you are looking for a centrally located villa, look no further! Villa Crystal is 10 minutes on foot or a couple of minutes' drive from the resort centre where there's a good number of shops, bars and restaurants. What's more the beach of Galera is within 10 minutes' walk away. The villa has a private pool surrounded with sun loungers and a BBQ - all much needed ingredients for your holiday! WiFi, pool heating and air conditioning/heating in the bedrooms are included. A great location and the beach is only a short walk away - the perfect choice for your holiday! Outside you will find a pergola , which is home to the outside dining table with chairs and the pool table. This is a perfect escape from the afternoon Canarian heat! The table tennis and BBQ facilities are next to it. Or, why not enjoy the sunshine on one of the loungers scattered around the pool with a cool drink. Villa Crystal has a private parking space located at the front of the building and from here through the gate is the main entrance to the villa. The lounge is spacious, bright and open plan with the dining area. Next to the dining table is a conservatory, which fills the room with natural light, and has views over the pool terrace. Patio doors from the lounge and dining room lead out onto the terrace and pool area. The fully equipped kitchen with all the modern appliances sits next to the dining area. Stairs from the lounge take you to the first floor where the both bedrooms are located. The twin bedroom has its own small balcony overlooking the front of the villa. The double bedroom has a window framing the views over the villa's private pool terrace. Both rooms share a separate bathroom. There is also a separate shower room on the ground floor. 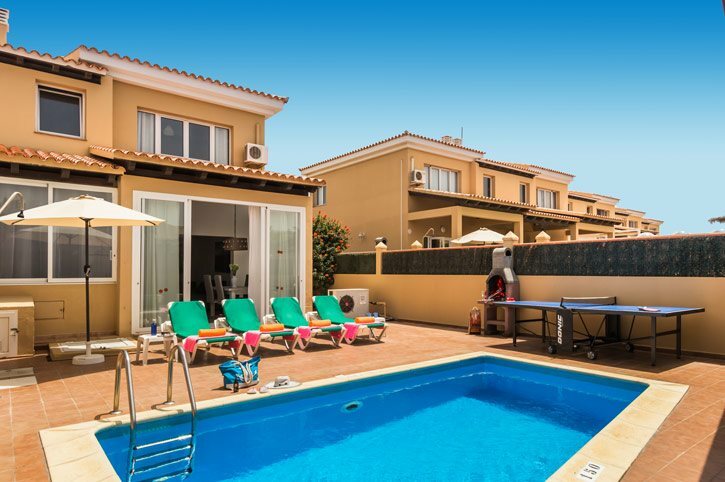 This semi-detached villa is only 10 minutes' walk away or a few minutes in the car from Corralejo Centre. It has a bustling main promenade offering a wide variety of shops, bars and restaurants to suit all tastes. The villa is also just a short stroll from the El Campanario Shopping Centre and Galera Beach. The beautiful beach of Grandes Playas and famous dunes are both just a short drive away. Our Villa Las Margaritas is next door. Villa Crystal is a short walk from the El Campanario Shopping Centre , which also has weekly weekend market. For those who want a bit of retail therapy, there is a number of shops along Corralejo's promenade. The chic shopping centre of Las Palmeras is also here. The lively main promenade of Corralejo has a wide variety of bars and restaurants serving fresh produce from the island, to suit everyone's tastes. Enjoy lunch at one of the tapas bars which have typical local food from the island and cater for everyone's taste. At Corralejo harbour there are good quality local restaurants. The closest beach to Villa Crystal is Galera Beach, 10 minutes' walk away. Alternatively, there are the beaches of Bahia Real, Waikiki and of course, the spectacular Grandes Playas. The Acua Waterpark in Corralejo offers a variety of water slides and tubes or you may choose to venture in to the wave pool or the lazy river! You can even try your hand at crazy golf which is also located at the Acua Waterpark. There is another crazy golf course situated at the Plaza in Corralejo. Fuerteventura's former capital, Betancuria lies in a picturesque valley next to a dried up stream, which flowed up until the 16th century. Here, the Centro Insular de Artesania, next to the museum, documents traditional arts and crafts - if you want to see some local handicraft this is the place to come! Make a visit to the Casa Santa Maria and watch local artists at work or even purchase some of the hand made products from the quaint local shop. El Cotillo is a small little fishing village and is the surfing and windsurfing Mecca of the island. Hiking tours are arranged by the local council and full information can be found in the tourist office in Corralejo. The expansive sand dunes and golden beaches are perfect for kite flying. Kites are available in many shops in Corralejo. Alternatively, you can try the go karting track in Puerto del Rosario. There is plenty to do in Fuerteventura! Villa Crystal is not available to book for season as it is sold out. Take a look here at the Fuerteventura villas that are currently on sale. This is the fourth time I have used Villa Plus since the early nineteen nineties and have always been very happy. Logistically faultless, beautifully well kept accommodation, could not have been happier. Will be strongly recommending Villa Plus to friends and family, and expecting to use again. A brilliant time was had in a lovely villa also very helpful and efficient company - will definitely use Villa Plus again in the future. Was very impressed with the whole experience and have already recommended Villa Plus to friends, will look to book again in April to another destination.